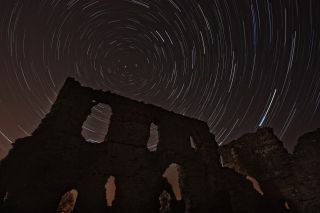 Distant stars above the ruins of Sherborne Old Castle in the UK. We are seeing into the past too. While sound travels about a kilometre every three seconds, light travels 300,000 kilometres every second. When we see a flash of lighting three kilometres away, we are seeing something that happened a hundredth of a millisecond ago. That's not exactly the distant past. Read more: Curious Kids: Are there living things on different galaxies? But as we look further afield, we can peer further back. We can see seconds, minutes, hours and years into the past with our own eyes. Looking through a telescope, we can look even further into the past. If you really want to look back in time, you need to look up. When we look at the Moon, we are seeing it as it was just over a second ago. The Moon is our nearest celestial neighbour - a world with valleys, mountains and craters. It's also about 380,000km away, so it takes 1.3 seconds for light to travel from the Moon to us. We see the Moon not as it is, but as it was 1.3 seconds ago. The Moon doesn't change much from instant to instant, but this 1.3-second delay is perceptible when mission control talks to astronauts on the Moon. Radio waves travel at the speed of light, so a message from mission control takes 1.3 seconds to get to the Moon, and even the quickest of replies takes another 1.3 seconds to come back. Radio communications to the Moon have a perceptible time delay. It's not hard to look beyond the Moon and further back in time. The Sun is about 150 million km away, so we see it as it was about 8 minutes ago. Even our nearest planetary neighbours, Venus and Mars, are tens of millions of kilometres away, so we see them as they were minutes ago. When Mars is very close to Earth, we are seeing it as it was about three minutes ago, but at other times light takes more than 20 minutes to travel from Mars to Earth. The light travel time from Mars to Earth changes as the distance to Mars changes. This presents some problems if you're on Earth controlling a Rover on Mars. If you're driving the Rover at 1km per hour then the lag, due to the finite speed of light, means the rover could be 200 metres ahead of where you see it, and it could travel another 200 metres after you command it to hit the brakes. Not surprisingly, Martian Rovers aren't breaking any speed records, travelling at 5cm per second (0.18kph or 0.11mph), and on-board computers help with driving, to prevent rover wrecks. Not surprisingly, Martian Rovers aren't breaking any speed records, travelling at 5cm per second (0.18kph or 0.11mph), with rovers following carefully programmed sequences and using on-board computers to avoid hazards and prevent punctures. The finite speed of light presents some challenges for driving on Mars. Let's go a bit further out in space. At its closest to Earth, Saturn is still more than a billion kilometres away, so we see it as it was more than an hour ago. When the world tuned into the Cassini spacecraft's plunge into Saturn's atmosphere in 2017, we were hearing echos from a spacecraft that had already been destroyed more than an hour before. The night sky is full of stars, and those stars are incredibly distant. The distances are measured in light years, which corresponds to the distance travelled by light in one year. That's about 9 trillion km. Alpha Centauri, the nearest star visible to the unaided eye, is at a distance 270,000 times the distance between Earth and the Sun. That's 4 light years, so we see Alpha Centauri as it was 4 years ago. Some of the brightest stars in the sky are hundreds of light years away. Some bright stars are much more distant still. Betelgeuse, in the constellation Orion, is about 640 light years away. If Betelgeuse exploded tomorrow (and it will explode one day), we wouldn't know about it for centuries. Even without a telescope we can see much much further. The Andromeda galaxy and the Magellanic Clouds are relatively nearby galaxies that are bright enough to be seen with the unaided eye. The Large Magellanic cloud is a mere 160,000 light years away, while Andromeda is 2.5 million light years away. For comparison, modern humans have only walked the Earth for about 300,000 years. As light moves at finite speed, we can see bursts of light echo off interstellar dust. With the unaided eye you can look millions of years into the past, but how about billions? Well, you can do that at the eyepiece of an amateur telescope. 3C 273 can be seen with a small telescope despite being billions of light years away. Quasar 3C 273 is an incredibly luminous object, which is brighter than individual galaxies, and powered by a huge black hole. But it's 1,000 times fainter than what the unaided eye can see because it's 2.5 billion light years away. That said, you can spot it with a 20cm aperture telescope. A bigger telescope allows you to peer even further into space, and I once had the pleasure of using an eyepiece on a 1.5-metre diameter telescope. Quasar APM 08279+5255 was just a faint dot, which isn't surprising as it's 12 billion light years away. Earth is just 4.5 billion years old, and even the universe itself is 13.8 billion years old. Relatively few people have seen APM 08279+5255 with their own eyes, and in doing so they (and I) have looked back across almost the entire history of our universe. With a big enough telescope you can see quasar APM 08279+5255 and look 12 billion years back in time. So when you look up, remember you aren't seeing things as they are now; you're seeing things as they were. Without really trying, you can see years into the past. And with the aid of a telescope you can see millions or even billions of years into the past with your very own eyes. This article is republished from The Conversation under a Creative Commons license. Read the original article. Follow all of the Expert Voices issues and debates — and become part of the discussion — on Facebook, Twitter and Google +. The views expressed are those of the author and do not necessarily reflect the views of the publisher. This version of the article was originally published on Space.com.